At the maiden edition of the Ghana Insurance Awards held at the plush Kempinski Hotel Gold Coast City, SIC Insurance was decorated with five awards out of the seven categories that the company was nominated for awards. 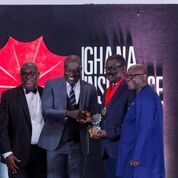 The Ghana Insurance Awards event brought together key industry players, sought to honour top-class performance, professionalism and innovation in the delivery of insurance services across the Ghanaian insurance industry, and to promote the growth of the industry. • Insurance ICT Leadership award. Speaking at the ceremony, the Managing Director of SIC Insurance, Mr. Stephen Oduro said indeed this is a 5-star sterling performance and congratulated his staff and all other insurance intermediaries whose dedication and effort made it possible for the company to attain this feat. He added that SIC Insurance is obviously doing something that is meeting the needs of today’s sophisticated customer. “We are changing our orientation on how we treat the customer. Until recently, the standard approach to marketing was dividing customers into segments and using broad demographic assumptions to serve them. Today, Marketing has gotten much more sophisticated and personalized, and customer service is following suit. At SIC Insurance, we see our customers as distinct individuals, go the extra mile to give each one a personalized experience,” he further added. Xodus Communications Limited, organizers of the maiden event congratulated all the award winners for their contribution and impact on the insurance industry in Ghana.